Double & Single Bed, Wardrobe, Bedside Cupboard & Set of Drawers plus separate Fitted Sheet, Pillow & Duvet. 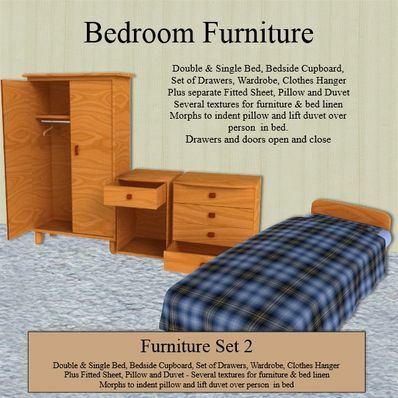 Several textures for the bed linen and furniture included. All drawers & doors open & close. Morphs included to indent pillow and to raise duvet over a person in bed. Awesome and well designed! Thanks! Your single bed is like the one I used to have in high school. Thanks. Thank you very much. These have awesome woods textures. I love them. No way a hangar as well, it is sooooo hard to find a hangar. TKU, TKU!! No way, double and single bed with various textures. Plus the set of drawers with textures!! So wonderful, thank you!! Very nice bedroom items. Cool to see the bed morphs too. Thanks! Thank you these look amazing!